Andy Hill, Council Leader .... And Maybole Worthy! Update: December 2005. Councillor Andy Hill, Leader of South Ayrshire Council for more than five years, has resigned. Maybole resident Andy Hill has become one of the Burgh's best known citizens. 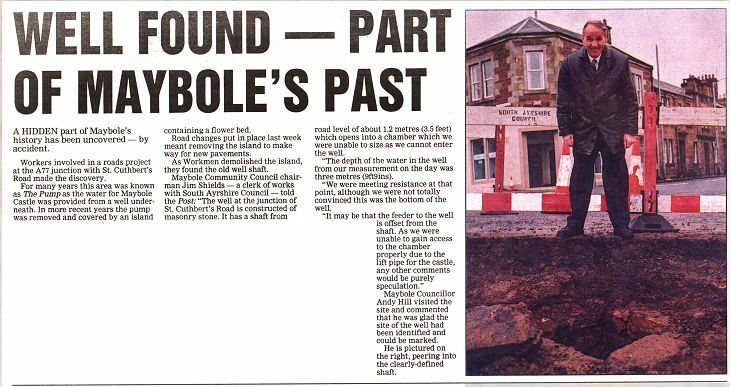 Despite not being an Ayrshire man by birth, Andy's name has long been synonymous with Maybole thanks to his commitment to serving the people of the town as a Councillor - firstly on Strathclyde Regional Council, and currently on South Ayrshire Council on which he is the Council Leader. Whether as a Councillor, responding to his constituents, or as a worthy ambassador for the town welcoming visitors from overseas including Beloeil, Crosne and Schotten, or simply as a genial family man, Andy certainly is a "well-kent figure" in Maybole. Born and brought up in Glasgow, Councillor Hill has spent most of his life living in Maybole, having moved to the town some 44 years ago. To Andy and his wife, Helen and grown up children Andrew and Elaine, Maybole is, without a doubt, HOME! Now aged 63, Andy Hill was formerly employed in the Stamp Works at Newton-on-Ayr and later in the Library at Maybole.His commitment to the well-being of the people of the town began when he was elected to serve on Strathclyde Regional Council, as Councillor for the Carrick Electoral Divison. He was Vice Chair of the Regional Council's Divisional Development Committee for the Ayr Division, and also served on the Regional Council's General Purposes Committee and Social Work Committee. When the Reorganisation of Local Government, and the creation of South Ayrshire Council in 1995, Andy was elected to South Ayrshire Council as Councillor for the Maybole electoral ward. 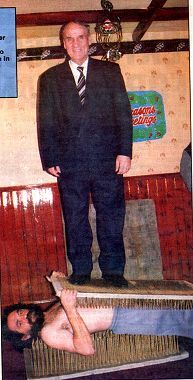 In May, 1999, when the number of wards was increased, and the Maybole ward split, Andy was successfully elected to the new North Carrick and Maybole East ward.During his Council service, Andy has demonstrated a particular interest in Council planning and licensing matters, and also affairs affecting the Council's rural areas. In the first three years of South Ayrshire Council, he served as Convener of the Council's Rural Affairs Committee and from May, 1999, until November, 2000, he was Convener of the Council's Strategic Services Committee. 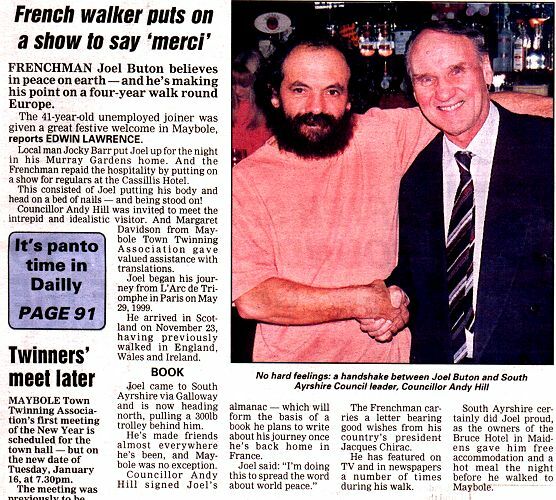 On June 22, 2000, after serving for a year as Depute Leader, Andy was voted by his colleagues to the prestigious position of Leader of South Ayrshire Council. As well as being Leader of the Council - and still retaining his responsibilities looking after the interests of constituents in North Carrick and Maybole East - Andy, or Councillor Hill, also held Convenership of the Council's important Policy and Resource Committee and its Sub-Committees. From the Council's inception, in 1996, Councillor Hill has also served on the Community Protection and Support Services Committee, and its Licensing Sub-Committee and also on the South Ayrshire Licensing Board. His vast range of external responsibilities have included being a Council representative on the Convention of Scottish Local Authorities, Alert, Ayr Town Centre Management Initiative, Ayrshire Chamber of Commerce and Industry, Culzean Country Park, Ayrshire Economic Forum, Ayrshire Joint Structure Plan Committee, West of Scotland Loan Fund and Strathclyde Passenger Transport Authority. From his working days in Ayr and Maybole, Andy has a wide knowledge of Trade Union affairs which stems from his practical involvement with both the A.E.U. and N.U.P.E.For a total of 20 years be was a member of the A.E.U. serving for seven years on the District Committee and holding the posts of Convener of Shop Stewards and Works Convener. Within N.U.P.E, he held the honorary office of both Chair and Secretary, and he also served as Depute Convener of Shop Stewards within Kyle and Carrick District Council.Andy considers his hobbies to be golf, and bowling, including membership of Maybole Bowling Club, and he has a healthy interest in football with a particular focus on the Scottish Premier League. His commitment to the Council and its responsibilities, however, means he has little time left to pursue these activities.